Last week I shared a before photo of a vintage campaign desk I had found at my local Salvation Army for only $30. I mentioned that I was planning to paint the desk a vibrant coral to add a pop of color to liven up the neutral colors of my office. As you may recall, this is what my vintage campaign desk looked like after I brought it home, before I began removing hardware, sanding, priming, sanding some more, and painting it. 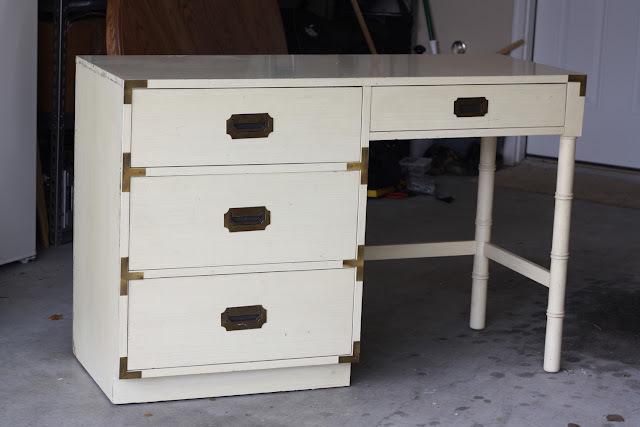 Though the desk was in pretty great shape, I wasn't crazy about the dingy cream color and decided to paint it and give the tarnished brass hardware a good polish. After several days of work to the desk itself, and several hours of polishing hardware, I'm pretty happy with the cheerful result of my hard work! The high gloss coral paint has a beautiful sheen that really makes the desk shine. The color itself is pretty unique and dimensional. In some lights the desk appears like a warm, pale orange, in others the pink in the coral stands out (it's definitely leaning more orange in these photos). Polishing the brass hardware that had over 30 years of tarnish was the most tedious part of refinishing the desk. First I let the hardware soak in Brasso for a good hour and tried polishing it with an abrasive sponge. That lifted a little tarnish, but didn't provide the shiny result I was looking for. Next I used a paste of Bar Keeper's Friend and water on a wash cloth and, after lots of scrubbing, that did the trick. The hardware is far from pristine, there are lots of scratches and still a good bit of discoloration present, but for a desk this old I'll accept the character. Overall I'm really happy with how my desk turned out! For those that are curious what steps I took to to refinish the desk and what products I used, keep reading. When I got the desk home, I set up a work area in the garage. First I removed all the hardware from the dresser and set it aside. I then removed the drawers and set them on folding tables, with the drawer fronts hanging off for the duration of the project. I decided to place the desk on a low table to work on it so I wasn't on my knees for most of the project. I am SO glad I did this because I was able to sit in a chair and really get a better angle for working on the bottom half of the desk. This made the task a lot less tedious than it would have otherwise been. Once everything was set up, I began sanding the desk lightly with medium grit sandpaper. Because the primer I used, Zinsser Cover Stain, doesn't actually require sanding of glossy surfaces, this step wasn't necessary. However, because this will be a high use item, I decided to take as many extra steps as I felt necessary (without going overboard) to insure the paint job holds up for years to come. After lighting sanding the desk and drawer fronts, I wiped everything down with a damp cloth to remove all dust from the desk. After everything had dried completely, I began brushing on the primer. I used two coats of Zinsser Cover Stain primer, followed by another light sanding (this time with fine grit sandpaper) and a wipe down before painting. As I mentioned in my previous post, I used Benjamin Moore's Advanced paint in Coral Gables with a high gloss finish. I brushed on three coats of the paint, letting each dry completely to the touch before applying the third. Because this paint takes a while to fully cure and harden, I allowed the desk to dry in my garage for five days before I polished and reattached the hardware. 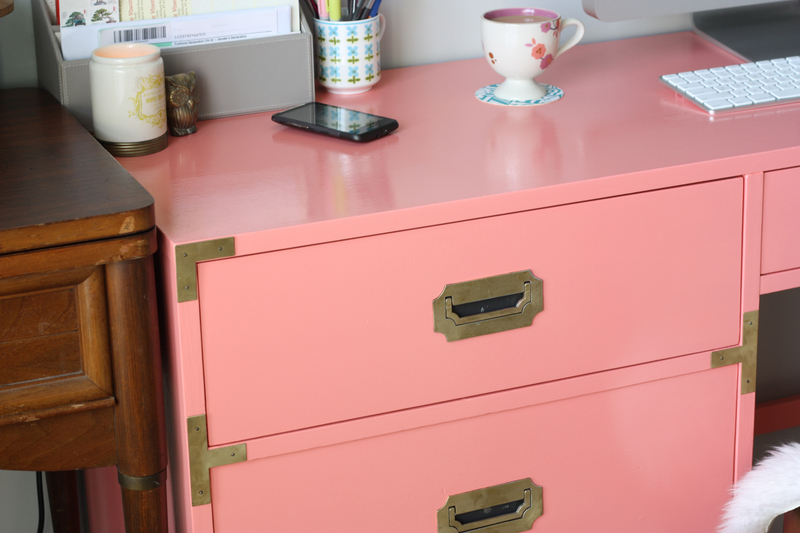 This was my first time painting a piece of furniture and I relied very heavily on tips that Kate of Centsational Girl provided in this post (where she actually refinished this very same desk!). 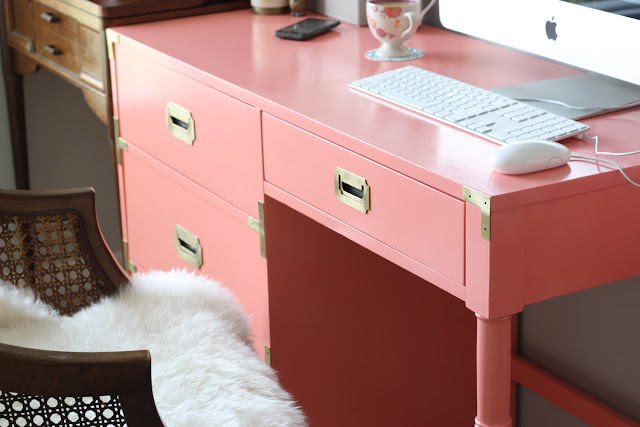 I definitely suggest you check out her blog for amazing tips on painting furniture. Beautiful job! The color really is lovely. Thank you! The color has inspired me to work in more colorful accents as I do more updates to my office. I can't wait to share the progress as I make changes over the next few months. What a great transformation! 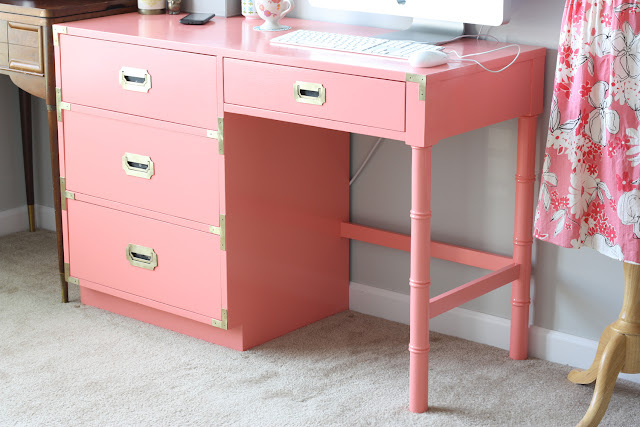 I'm currently redecorating my room - having painted the walls and skirting, my next project is my desk! Good to see you took the plunge with a bright colour! I think a soft purple would be lovely! I found you through Thistlewood Farm. 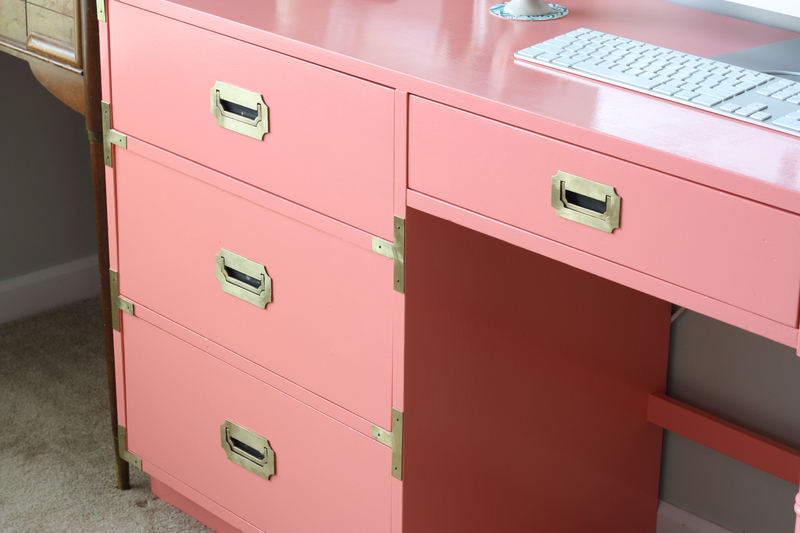 And I love this makeover...the gold with the pink sings! 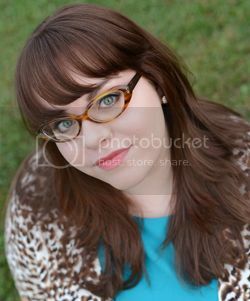 Pinning it from your blog!